Using search box you can list out the total stocks for a particular item. As you can in above example, "Apple" is highlighted and its total stock keeping unit is 4. Since "Apple" is used as an ingredient in a recipe in which Amul butter (500Gm Pk), Cinnamon Powder (100Gm) and Nutmeg are used, 3 more stocks of it add up to the list. Filters button is used to filter the listed SKUs based on applicable categories. Categorization and tagging of SKUs should be done to use this functionality. Select the categories from the dropdown and click Apply button to see the SKUs that fall under the selected category. 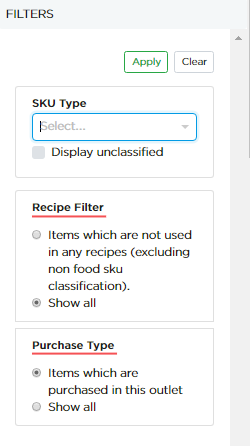 Recipe Filter: By default, system displays all the SKUs. 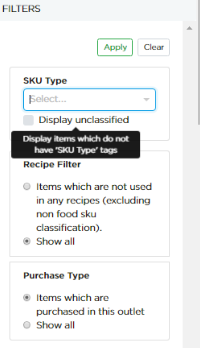 In case if you want to view the items which not used in any of the recipes, you can have an option called "Items which are not used in any recipes (excluding non food sku classification)." as shown in above screen shot. Purchase Type: By default, system displays the items which are purchased in that particular outlet. In case if you want to view all the items, you have a option like "Show all" as shown in above screenshot.